Liakata, M., Saha, S., Dobnik, S., Batchelor, C., & Rebholz-Schuhmann, D. (2012). Automatic recognition of conceptualization zones in scientific articles and two life science applications. Bioinformatics, 28(7), 991-1000. Scientific discourse analysis helps in distinguishing the nature of knowledge in research articles (facts, hypothesis, existing and new work). Annotation schemes vary across disciplines in scope and granularity. To build a finer grained annotation scheme to capture the structure of scientific articles (CoreSC scheme). To automate the annotation of full articles at sentence level with CoreSC scheme using machine learning classifiers (SAPIENT “Semantic Annotation of Papers: Interface & ENrichment Tool” available for download here). 265 articles from biochemistry and chemistry, containing 39915 sentences (>1 million words) annotated in three phrases by multiple experts. XML aware sentence splitter SSSplit used for splitting sentences. Background (BAC), Hypothesis (HYP), Motivation (MOT), Goal (GOA), Object (OBJ), Method (MET), Model (MOD), Experiment (EXP), Observation (OBS), Result (RES) and Conclusion (CON). Sentences classified independent of each other. Uses Support Vector Machine (SVM). Features extracted based on different aspects of a sentence: location within the paper, document structure (global features) to local features. For the complete list of features used, refer the paper. Labels assigned to satisfy dependencies among sentences. Uses Conditional Random Fields (CRF). F-score: Ranges from 76% for EXP (Experiment) to 18% for the low frequency category MOT(Motivation) [Refer complete results from runs configured with different settings and features in Table 2 of the paper]. Classifiers: LibS has the highest accuracy at 51.6%, CRF at 50.4% and LibL at 47.7%. Can be applied to create executive summaries of full papers (based on the entire content and not just abstracts) to identify key information in a paper. CoreSC annotated biology papers to be used for guiding information extraction and retrieval. Generalization to new domains in progress. Reference: Anthony, L., & Lashkia, G. V. (2003). Mover: A machine learning tool to assist in the reading and writing of technical papers. IEEE transactions on professional communication, 46(3), 185-193. Identifying the structure of text helps in reading and writing research articles. The structure of research article introductions in terms of moves is explained in the CARS model (Ref: J. M. Swales, “Aspects of Article Introductions,” Univ. Aston, Language Studies Unit, Birmingham, UK, Res. Rep. No. 1, 1981.). Identifying the moves in a particular type of article. Time-consuming identification of moves by raters (manual annotation) with no immediate feedback. To provide immediate feedback on move structures in the given text. Using supervised learning to identify moves from 100 IT research article (RA) abstracts. Machine readable abstracts were further pre-processed with subroutines to remove irrelevant characters from raw text. Dividing input text into clusters of 1-5 word tokens to capture key phrases and discourse markers as features. Bag of words model does not consider word order and semantics by splitting input text into word tokens – not useful in the discourse level. Not useful clusters (noise) removal using statistical measures – Information Gain (IG) scores used to remove clusters below threshold. ‘Location’ feature added to take note of preceding and later sentences – position index of sentence in the abstract. Additional training feature for the classifier – probability of common structural step groupings. Naive Bayes learning classifier outperformed other models. Tool available for download as AntMover. When two most likely decisions are used (instead of predicting only one class) using the Naive Bayes probabilities, accuracy increased to 86%. Flow optimization effectiveness improved accuracy by 2%. Manual correction of steps adding new training data (second opinion of students on the moves classified by the system used for retraining the model). identify unnoticed moves in manual analysis. analyze moves much faster than manual analysis. better understand own writing and prevent distorted views. Important vocabulary can be identified for teaching from the ordered cluster of words. Trained examples can be used as exemplars. 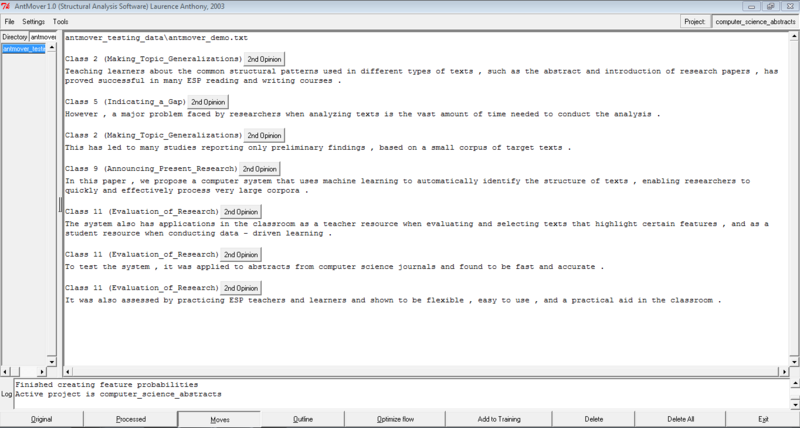 Aid for immediate analysis of text structure. Increasing the accuracy of Mover. Expanding to more fields – currently implemented for engineering and science text types.